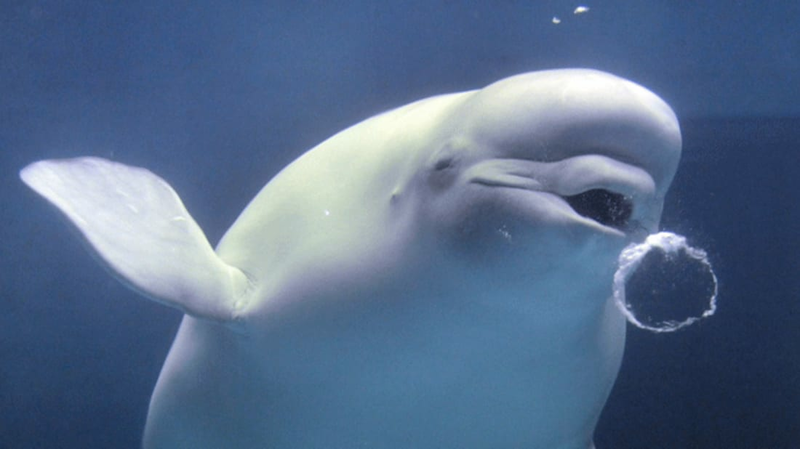 A recent study suggests that the bubbles blown by beluga whales are more than just adorable. In a new paper currently under review for publication in the journal Aquatic Mammals, researchers report that belugas use bubbles to communicate with whales around them. Animal behavior researchers Elizabeth George and Michael Noonan recently talked to Discover about their research, which they gathered by studying 44 captive belugas at Ontario's Marineland over the course of eight years. They found that the whales create four distinct bubbles types—blowhole drips, blowhole bursts, blowhole streams, and mouth rings—and that each corresponds to a different state of mind. Rings and bubbles slowly released from the blowhole are normally signs of playfulness, while an abrupt bubble burst could be a defensive reaction in the presence of a threat. Mother belugas have previously been observed blowing bursts of bubbles to fend off surrounding whales when swimming with their calves. In this new study, they were shown to create the bursts in response to alarming noises and other unexpected events. Anyone familiar with belugas shouldn’t be surprised that they also blow bubbles for fun. The whales are some of the most playful creatures on Earth—especially the females—and devote approximately one-third of their time to play. They often create shimmering bubble rings with their mouths just to entertain themselves. But bubbles can also provide an opportunity for social bonding. Sometimes one whale will blow a bubble to have another one pop it, or two whales will blow matching bubble rings. This latter behavior is especially prevalent in whales with close bonds, like pairs of affiliated males or mothers and calves. With other bubble-blowing patterns, the ultimate purpose isn’t as clear. Male belugas are sometimes observed swimming beside one another while blowing steady streams of bubbles, a behavior that has researchers perplexed. Humpback whales do something similar as a means of intimidation when competing for mates, but in belugas it appears to come from a more amicable place. The researchers behind the recent study suspect the stream might be a form of bonding between the whales. With all these findings, it’s important to keep in mind that most of the research on their bubble-blowing behavior has been conducted on whales in captivity; belugas are difficult to study in the wild. So the actions of captive belugas may differ from those in natural habitats.